The Fitz waterwheel Company started in the summer of 1902. Its history leading up to this date started back in 1840 when Samuel Fitz operated the Hanover Foundry. This machine shop provided a number of services ranging from casting of segment and spur gears to metal parts needed in outfitting horse wagons in addition to building wooden waterwheels. Around 1850, while running the Hanover factory, Samuel Fitz took over the Tuscarora Iron Works from Daniel Kennedy who had died at a young age. By this time wooden waterwheels were being made with metal hubs and axles. Some all metal waterwheels were also being made in England and finding their way to the United States. The advantage of having an "All Metal Waterwheel" was better machinery efficiency performance and simpler maintenance. Metal waterwheels also allowed the milling of products longer into the winter because the wheels would not freeze up. The performance increase was due to a curvilinear bucket (rounded shape). This type bucket reduced the turbulence of the water entering the bucket cavity, it also held the water longer in the buckets increasing the time duration of wheel cycle and had less water spillage. John Fitz (the son of Samuel) made his mark by being able to set up his machine shop to fabricate these metal water wheels using mass production processes. He had developed a standard metal bucket for a full range of wheel sizes, defined side panels to fixed sizes and an onsite assembly procedure that allowed most owners to assemble their new wheels with little assistance from a technician traveling in for site assembly. In looking at his machine shop work orders, even the total count and sizes of the rivets needed were detailed for each waterwheel order. The Hanover factory and the Tuscarora Iron Works merged to form the I-X-L Water Wheel Company. Fitz had bought the name IXL from a turbine company he acquired around 1870 - 1880. If you look at it you see the phrase "I excel". By the late 1800's the company was in full production of a full line of sizes of the world famous I-X-L Steel Overshot Water Wheel. In addition, the company continued to manufacture and restore all types of waterwheels. Fitz even manufactured wooden wheels for those clients who were committed to this type of wheel. 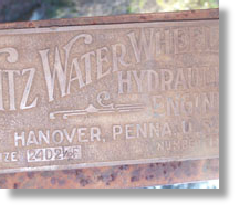 The company continued to grow and on July 15, 1902 the company changed its name to the Fitz Water Wheel Company of Hanover, PA.
Fitz was a master when it came to marketing his products. He would produce and widely distribute his bulletins where he would present pictures of his waterwheels in many different locations doing a full assortment of jobs. He would go on page after page with countless letters of praise by their owners on how their new water wheel was the greatest investment they had made to their company. In almost all his advertising, you would see many pages describing why metal waterwheel was far superior to wooden wheels. 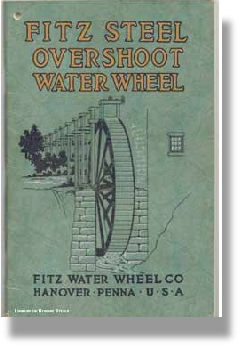 One of the main reasons for the success of the Fitz Water Wheel Company was not in its advertising but in the product itself. The first Fitz wooden wheels had a power efficiency of around 70%. Not bad for the time. With the introduction of the I-X-L Overshot Waterwheel, Fitz claimed over 90% efficiency. Fitz made sure he told the world about his great efficiency rating after a 136 page report was conducted in 1898 by the University of Wisconsin, Engineering School, and was posted to the public in 1913. By the late 1920's the Fitz Water Wheel Company was the largest vertical waterwheel manufacturer in the world. Unlike turbines that lost their effectiveness with a small shift of water pressure, vertical waterwheels would continue to run in a low water volume situation. This made them ideal for factories and farms where water tables would vary widely during the year and product production was needed all year. Fitz not one to miss all avenues of profit, understood what situations in the field a turbine was the better product to use. I say this because most of his advertisement presented a negative picture of turbines in general. Back in 1860's he started to market the Burnham Turbine. Fitz later improved on that design and called it the Fitz-Burnham Turbine. By the 1930's the company had a full line of turbines like the "Fitz Michell Hydraulic Turbine", the Ruralite and the "Fitz Hanover Turbine". As the 1930's passed and steam, diesel and gas engines took over the market place for power generation, Fitz continued to stay in business selling his wheels in the United States. By this time a good percentage of his business was in wheel restoration. He had also opened up the hydro market to sales in South American and in Europe. Despite fewer new waterwheel sales, the company continued in business through the 1940's by utilizing the machine tools it had to produce waterwheels, into making other machine parts. This can be seen by the number of orders placed by the air force in machine parts needed for aircraft. It also ventured in making portable turbine generators used during World War II. The company went out of business in 1965. By this time it was being run by the third generation Fitz. Much of the technical drawings and patterns were sold to the Leffel turbine company. Leffel, a leader in the turbine business at the time, did this to destroy them so another company could not buy them to re-manufacturer Fitz parts and people needing to buy a turbine would have to buy Leffel Turbines instead. A lot of the office documents and correspondence of the Fitz Company can be researched at the Hagley Museum in Wilmington, DE. To guess at a total number of wheels Fitz made is almost impossible. It would be safe to say over a few thousand just in the upper southeast of the US would be a good starting number. Chances are, when you run across a metal water wheel it will be a Fitz wheel. Fitz however, was not the only manufacturer of metal waterwheels. Campbell and Savage Water Wheel Company were two companies that shared a small percentage of metal waterwheels in this country. It is interesting to note that Campbell before starting his company worked for the Fitz Company for awhile. Because most Fitz wheels have a standard bucket design you can figure that for every 1 ft of width of the bucket you will be able to handle 2.7 cfs of water. The number of buckets on a waterwheel is relative to the circumference of the wheel in feet, and that the spacing for buckets should be about 1 foot apart. One can use the following in determining the number of buckets (n) in a wheel. (n) = Pi * (D)iameter of the wheel. Once you know (n) you can determine the spacing (s) by using s = (pi*D)/n. The velocity of the water entering the water wheel should be about twice that of the rotation of the wheel.